Till now, we are providing you with the recipe ideas of Indian street food and curry, but today coming up with the new and innovative thing, which is an epitome of cooking art that tells how can we prepare delicious and tempting food from the common and unassuming ingredients by just using new technique in its preparation. Yes, we are talking about the multi-layered shallow fried north India flat bread, Lachha Paratha, also known as Kerala Parotta in the Malabar region of Kerala. 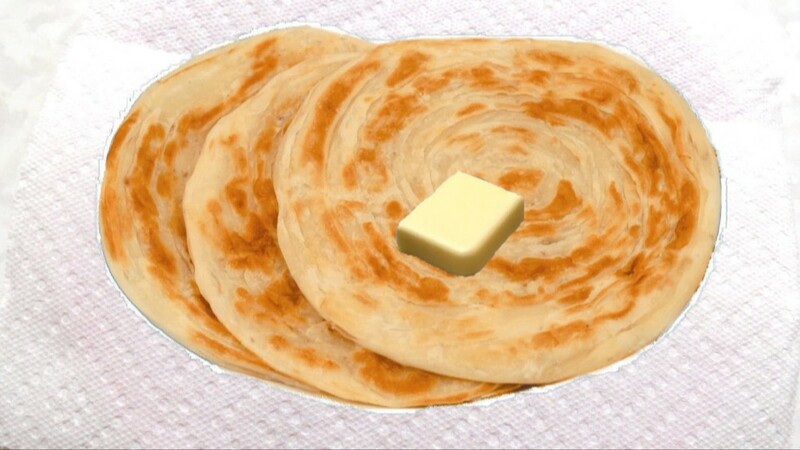 To prepare Lachha Paratha is very easy having 2 to 3 techniques by which you can cook it properly. Generally, people think that only expert cooks can prepare this, however, with a simple and easy recipe, everyone can cook it at home. Here, you can find step by step recipe explained in a very easy way, so jot it down and try at home. These “parathas” is a treat with any meal and can be served with any gravy base dish of your choice. Add all purpose 1 cup of all-purpose flour, 1 tbsp of oil and salt in a large bowl. Start kneading the smooth dough by mixing all the ingredients and adding warm water in a very small amount. Knead properly, until soft like Chapati dough. Grease the surface of dough with ½ tbsp of oil and cover it with the cloth. Leave it for around 25 minutes. After that, divide it into 4 equal pieces and give each a shape like a ball. Now, take one ball, flat it by pressing between your palms and then, coat it with dry dough. Place the dough ball on a rolling board (chakla) and roll out in a circular shape with the help of a rolling pin (belan). Spread ½ tbsp of ghee or oil uniformly over the entire surface using your hands or brush and sprinkle 1 tsp wheat flour over it. Now, hold up around 1/3-inch wide strip with your first two fingers and thumb from the top edge of rolled raw paratha. Lift and fold backwards such that top edge remains on top. 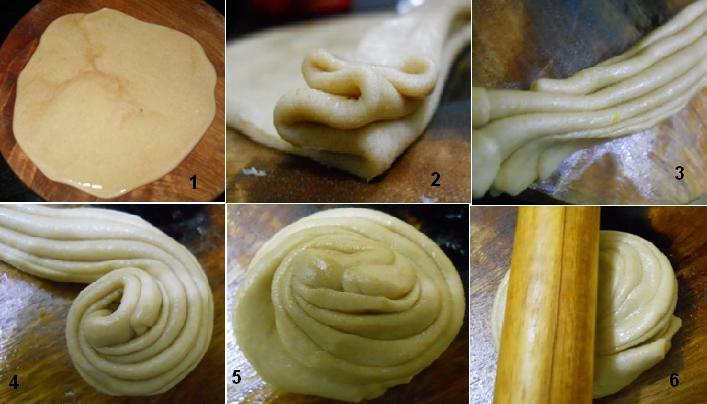 Now, hold two ends of the same strip and repeat the process, until entire paratha rolled. Now hold each end of a long strip with your first two fingers and thumb. Slightly lift the strip away from the rolling pin and give a few mild gently swings, this will stretch the strip a bit. Place the elongated strip on a rolling board in a horizontal way. Roll the one end like Swiss Roll, where press and stick the outer roll and keep it away from the other end. After completing this process, coat the roll with a dry wheat flour and place it on a rolling board. Carefully roll out it with a rolling pin without applying too much pressure and give it a round shape. Now, heat the griddle (Tawa) on a medium flame and place raw “Lacha Paratha” on it. When tiny bubbles appear on the surface, then flip it. Spread 1 tbsp oil over each side with the help of the spatula and cook till the both sides uniformly spread golden-brown spots. Transfer it into a plate and sprinkle butter or ghee according to your preference and serve them hot with the Indian curry. wow great i like laky Laccha Parathas very much.